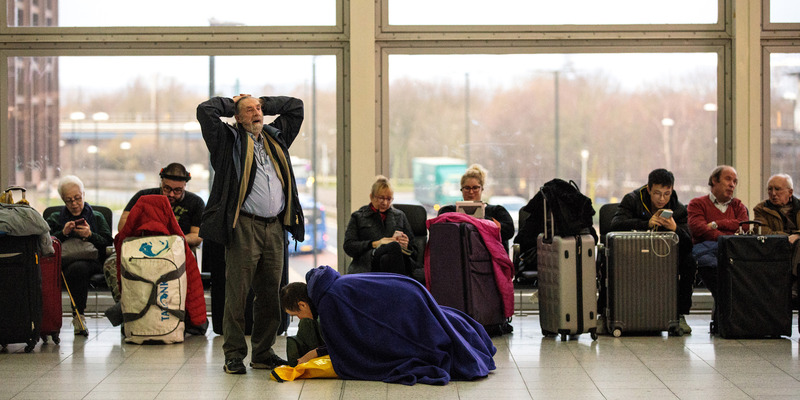 Passengers wait in the South Terminal building at London Gatwick Airport on Friday, December 21, after the runway shut over drone activity. British police are investigating the drone attacks that crippled the country's second-busiest airport in December as an inside job, the BBC reported Sunday. London Gatwick's COO said the perpetrators clearly had a way of knowing the airport's internal operations. Since the December incident, the airport has invested five million GBP on anti-drone measures. The drone attack at Britain's second-busiest airport wreaked havoc on more than 1,000 flights over 33 hours in December was likely an inside job, police say. London Gatwick's chief operating officer, Chris Woodroofe, told the BBC on Sunday that "It was clear that the drone operators had a link into what was going on at the airport." His comments were echoed by the Sussex Police, who told the BBC that the theory was a "credible line" of inquiry. Despite affecting more than 100,000 passengers' flights, the airport's COO says he does not regret closing the airport's RUNWAYS when the drones were spotted, as policy demands. "There is absolutely nothing that I would do differently when I look back at the incident, because ultimately, my number one priority has to be to maintain the safety of our passengers, and that's what we did," he said. According to The Guardian, Gatwick has invested 5 million GBP into anti-drone equipment in the five months since the attack. A system known as AUDS (Ant UAV defense system) is now in place thanks to a partnership from three British companies. Woodroofe says that the technology would have allowed the airport to better spot the attack, as the airport is now able to do. "We would know the drone was arriving on site and we'd know where that drone had come from, where it was going to and we'd have a much better chance of catching the perpetrator," he told the BBC.